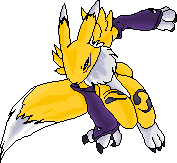 Think of the mercenary digimon that you might want. If DMO were to create another digimon, what digimon do you think it should be? Here's another... and most of these are already in the game as enemies! Having some of the x-digimon would also be cool.